We offer on the spot treatment for Chlamydia and Gonorrhoea and have established links with Manchester Centre for Sexual Health in order to ensure prompt referrals and continuity of care if needed. If you require a sexual health screen please contact the practice to make an appointment with one of the Practice Nurses, alternatively there are other centres which can provide further services. 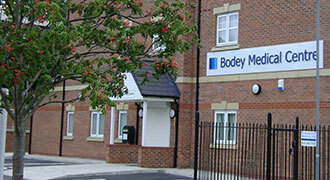 The Bodey Medical Centre has been established in the Fallowfield area of Manchester for over 40 years. Increasingly the Fallowfield area of Manchester has become populated by students from The University of Manchester and the Manchester Metropolitan University. Student residences at Owens Park, Oak House, Richmond Park, Ashburne Hall and Woolton Hall form a large proportion of this cosmopolitan area of Manchester. We provide GP Doctor consultations as well as nurses appointments for everyday medical problems. We run a dedicated sexual health service as well as an ‘on the day’ clinic for urgent clinical needs. Students at the university are reminded that they are required to register with a local GP doctor when studying and staying in Fallowfield Manchester. Although a large proportion of our local Fallowfield population is student we do still provide GP doctor and General Practice medical surgery services to other members of our community just like any other GP surgery, so all members of the community are welcome to register.